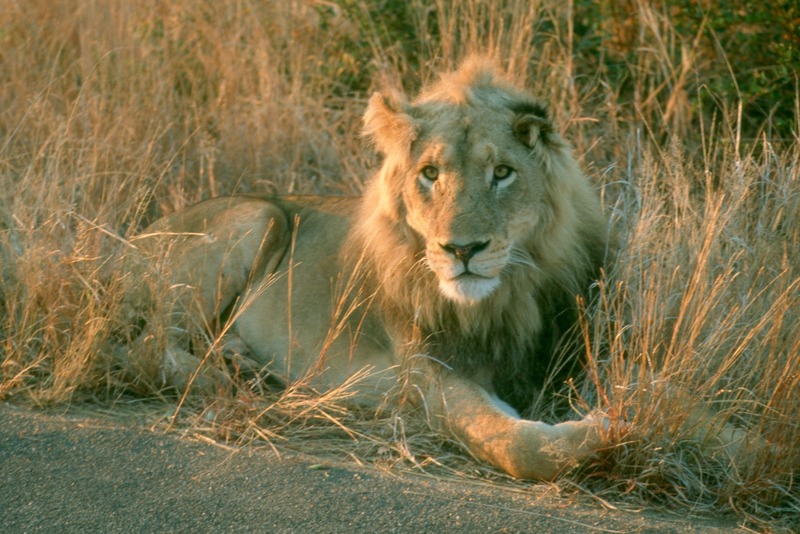 Kruger Mpumalanga International Airport (IATA: KMIA), located 25km north east of Nelspruit, is the gateway to the Kruger National Park, many other wildlife areas in Mpumalanga & Limpopo as well as to wildlife reserves in Zimbabwe and Mozambique. The airport has recently undergone extensive upgrades and is offering the traveller banking facilities, ATMs, VIP lounges and car rental depots. 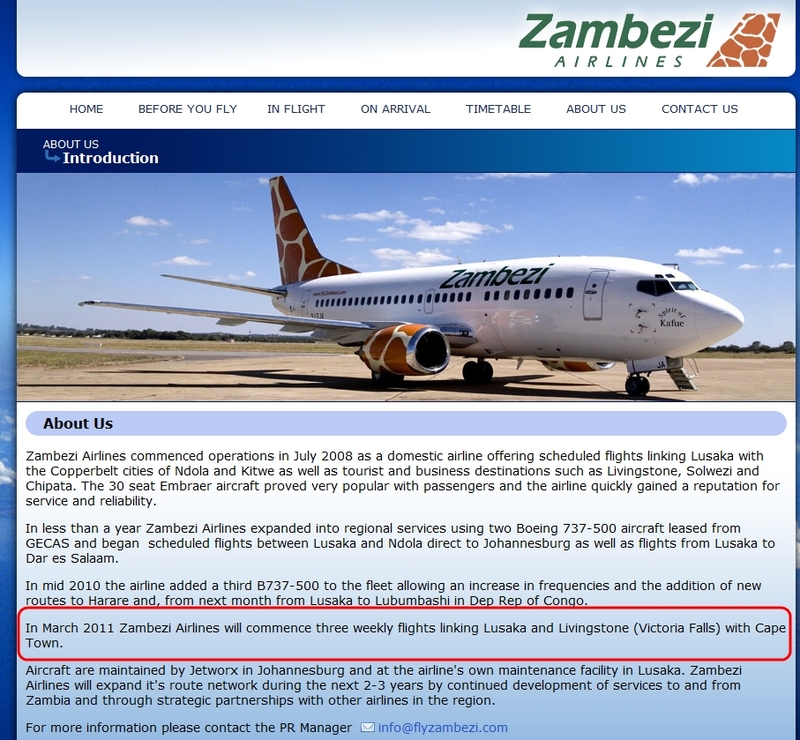 Zambezi Airlines to start Livingstone <> Cape Town flights? I just read on twitter (thx to @JollyboysZambia & @livilodge) that there are rumours "that Zambezi Airlines will be starting a direct Cape Town to Livingstone flight soon". 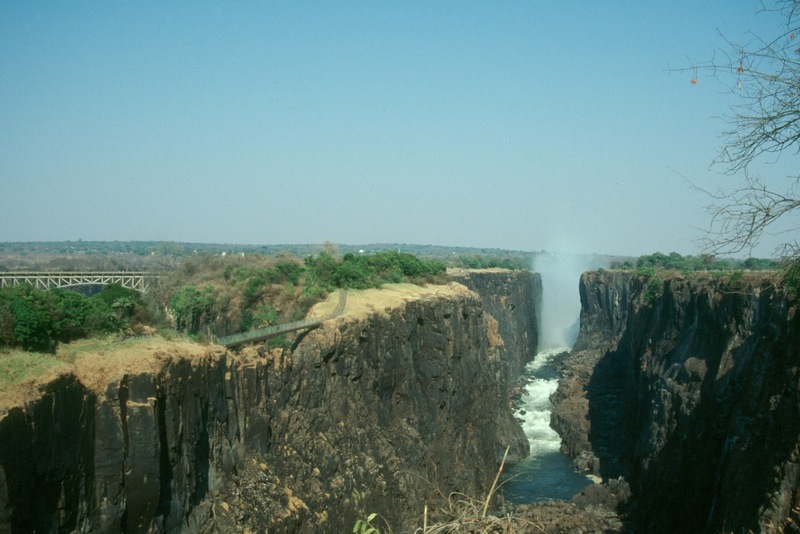 In March 2011 Zambezi Airlines will commence three weekly flights linking Lusaka and Livingstone (Victoria Falls) with Cape Town. Today is already the 31 March 2011 - does anyone have any further info? Much as travellers have come to enjoy the sights, sounds and experiences of the Garden Route and Route 62, explorers of the Western Cape can now unlock the treasures of eight rural Cape towns and their surrounding regions with the newly launched Cape Country Meander route. Located on the other side of Cape Town’s Sir Lowry’s Pass border, The Cape Country Meander comprises eight towns – Grabouw/Elgin Valley, Botriver, Caledon, Riviersonderend, Tesselaarsdal, Greyton, Genadendal and Villiersdorp. Six mountain ranges, three magnificent mountain passes and seven dams, including the Theewaterskloof Dam, provide the natural backdrop to this attractive route. The route journeys through fine wines, cuisine and family adventures along the historic trails cut by our indigenous peoples. Explorers, adventure-seekers, traders, missionaries and farmers have all left their mark on the region, which is today a sought-after lifestyle option for those wanting to escape the city. Easily accessed through the overarching themes of Food & Beverage, Adrenaline Adventure and History & Culture; The Cape Country Meander has much to offer independent travelers, action seekers, families and groups all within close proximity to Cape Town. The Potlekkertjie Loop will be closed from the top of the Klipspringer Pass to the section just before the Doornhoek Picnic Site. Visitors will still be able to access Klipspringer Pass but will need to turn around at the top of the Pass instead of exiting via the Potlekkertjie Loop. Part of the Potlekkertjie Loop will be accessible via the entrance to this Loop which starts near the entrance to the Klipspringer Pass. The Pienaars Pass 4x4 Trail is closed until further notice due to the road maintenance. If you want to visit the Zambian side of the Victoria Falls, but you are staying in Zimbabwe, you'll need an entry visa for Zambia. Day visa are available and can be obtained at the border for $US20. To re-enter Zimbabwe you'll need a re-entry visa for Zimbabwe. Such re-entry visa, or multiple entry visa, cost $US45. If you only have a single-entry visa, you can also purchase another single entry visa on the spot when you return to Zimbabwe, for $US35. So-called "double entry visa" are also available, but they cannot, like all other multiple entry visas, be obtained at the port of entry into Zimbabwe. TIPP: The Victoria Falls Bridge crosses the Zambezi River just below the Victoria Falls. As the Zambezi is the border between Zimbabwe and Zambia, the bridge links the two countries. If you only want to take a look at the Victoria Falls from the bridge, you can pass through the Zimbabwean border post at the Zimbabwean end of the bridge and walk ahead without any requirement for additional visas, though you will need your passport. In "The Last Lions" filmmakers Dereck and Beverly Joubert (also see TEDtalk: Beverly & Dereck Joubert - Life lessons from big cats) follow the epic journey of the lioness named Ma di Tau (“Mother of Lions”) in the wetlands of Botswana’s Okavango Delta as she battles to protect her cubs against the daunting onslaught of enemies to ensure their survival. When Ma di Tau goes to hunt, she must leave behind her young cubs. This exposes them to many dangers - including other lionesses. Both the Tatasberg Wilderness Camp and Richtersveld Camp Site at the Richtersveld National Park have been closed for reservations up to 10 June 2011 due to flood damage. The Richtersveld National Park is a rugged, desolate "mountain desert" set in a great loop of the Orange River. The Park is situated in South Africa's Nothern Province, bordering the country of Namiba. Together with the Namibian |Ai-|Ais Hot Springs Game Park and the Richtersveld National Park forms the |Ai-|Ais/Richtersveld Transfrontier Park. Zimbabwe's government is about to implement a Wildlife-Based Land Reform Policy, which will force the country’s predominantly white wildlife conservancy owners to hand over 51% of their shares to black Zimbabweans. A total of 59 "indigenous people" are getting leases from the Government or sharing conservancies with white former owners. Thirty-nine of these people were allocated leases in Masvingo, 21 in the Midlands, and three in the Matabeleland region. Officials have also promised to tackle any operational problems that might arise. According to Parks and wildlife authority director-general Vitalis Chadenga, the project was "one of the unfinished businesses of the country's land reform programme." Under land reforms launched by long-time President Robert Mugabe in 2000, Zimbabwean authorities seized, led by pro-Mugabe militants, farms from thousands of white owners in what the country's president called a correction of historical imbalances in the former British colony. As a result Zimbabwe is now facing a massive food & health crisis and strong economic problems. Wines of South Africa launched the world’s first industry-wide sustainability seal to guarantee the production integrity of its bottled wines. Every seal carries a unique number and is backed by a highly sophisticated tracking system to ensure the contents of the wine bottle to which it is applied can be traced back to source at every stage of the supply chain. The seal is still the only one of its kind worldwide, and has the backing not only of most South African exporters of bottled wines but also the international wine trade. According to Wines of South Africa, 50% of South African wines will go out with this seal in 2010, and over 80% by the 2011 vintage. By the end of last year the sustainability seal was already being applied to over 80% of bottled wine exports certified for Wine of Origin. 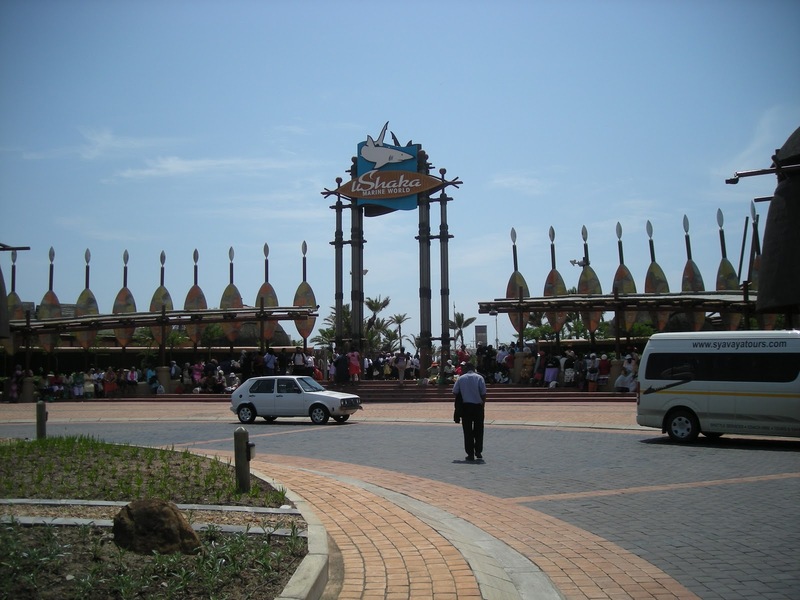 Your tour of the uShaka Marine World will comprise a saltwater aquarium with over thirty indoor and outdoor displays, and exhibits of South Africa's unique Indian and Atlantic Ocean marine life. At the end of Durban's Golden Mile, is the beginning of a new world of fun, entertainment end excitement. uShaka Marine World, spanning over 15 hectares of prime beach front, is Africa's largest marine theme park. Incorporating fresh and sea water, lush vegetation, natural materials and the recreation of a 1920's cargo ship wreck, uShaka Marine World had created a magical world of sea and marine life. With shark cage dives, ocean walkers, helicopter rides, surf lessons and scuba diving options at an additional cost at the park, there is plenty to keep the whole family busy for the day! Great White Sharks are usually know as "the ultimate predator" of the oceans, but did you know that the mighty sharks became prey to Orcas, or "killer whales"? Whale-watchers off the coast of San Francisco witnessed a stunning act of nature as a killer whale rose to the water's surface with a Great White in its mouth and held it there for 15 minutes. Luckily biologist Peter Pyle was nearby and able to get underwater footage of the whales feeding on the shark. Looking for (overland) tours in Southern & Eastern Africa in April & May 2011? Check Kumuka's late deals for some great discounts! False Bay and Gansbaai in South Africa are two of the World’s Top Shark Cage diving destinations. It is pretty hard to say which spot to choose over the other, because False Bay is way closer to Cape Town and Gansbaai (~ 2hrs drive from CPT) is offering the better chance to meet the Great White Sharks as the seal colony on Dyer Island is attracting them in greater numbers. The drive along the coast from Cape Town to Gansbaai is also very nice - in my view even better than the Garden Route. And you can stop at Betty's Bay to see the penguin colony. Join this tour for the underwater experience of a lifetime as you scuba dive or snorkel with the Great White Sharks of South Africa! Take the opportunity during your stay in Cape Town to travel to the channels around Dyer Island and get up close and personal with the animal on top of the ocean's food chain. Travel to Gansbaai and enjoy a light breakfast before proceeding to the channel by Dyer Island, a short boat trip of approximately 20 minutes. Named after Samson Dyer in the 19th century, Dyer Island is a breeding ground for marine birdlife, while nearby Geyser Rock is home to approximately 50,000 Cape Fur Seals. As a prime breeding site for these animals, the area is a natural magnet for the ocean's deadliest predator. Check out the sharks with a surface view, before slipping into your wetsuit to join these misunderstood creatures in their natural habitat. Choose to snorkel, or scuba cage dive (must hold a valid scuba diving certificate) with the magnificent predators in their natural feeding ground. This is a rare opportunity to share the water with the top ocean predator, and feel the ultimate adrenaline rush as it looks you in the eye with curiosity and maybe a touch of menace! If you don't want to enter the water, you can remain on the boat and enjoy the surface viewing. Being a surface feeder by nature the sharks swim close to the boat, therefore view onboard is superb and photo opportunities are lurking everywhere. If you are lucky, you may even get the opportunity to witness a spectacular breach as these huge creatures launch themselves clear of the water surface in the hunt for the next seal meal! They don't say where the video was shot, but macaques are the most widespread primate genus, ranging from Japan to Afghanistan and, in the case of the Barbary Macaque, to North Africa. It actually does not really matter where the video was shot - the drunk monkeys are simply hilarious! Talking about drunk animals. Do you remember Animals Are Beautiful People from 1974? update (21 April 2011): Air Zimbabwe resumes normal flights today (21 April 2011) after the strike by pilots ended yesterday following a Government intervention. It is not clear over what period they would be paid the money, but it was revealed that the Zimbabwean Government agreed to pay the pilots about 67% of what they were owed. update (20 April 2011): Stakeholders in Zimbabwe's tourism sector have called on the government to quickly resolve the Air Zimbabwe pilots impasse to enable easy access and travel of both local and international tourists during the Easter holidays. update (18 April 2011): Air Zimbabwe is considering leasing additional aircraft from other airlines to service its regional and international routes which are currently not being serviced due to the strike by its pilots. Already Air Zimbabwe is leasing Zambezi Airways to service the Harare-Johannesburg route and recently added the Harare-Victoria Falls route. update (16 April 2011): Air Zimbabwe may collapse if the majority of shareholders (the Zimbabwe government is actually the majority shareholder!) do not chip in and re-capitalize the loss- making national carrier. Air Zimbabwe's acting chief executive, Innocent Mavhunga, told Xinhua (the official press agency of the government of China) when asked if it was possible for the airline to collapse in the same way Zambian Airways collapsed a few years ago: "Yes if nothing comes that can happen." update (15 April 2011): - via Zimbabwe Independent - Insiders revealed that the troubled national airline [Air Zim] was currently in talks with Zambezi Airways of Zambia to increase the frequency of its flights between Harare and Johannesburg, as well as servicing some domestic routes after failing to reach a deal with its striking pilots. Two weeks ago, Air Zimbabwe leased an aircraft and flight crews from Zambezi Airways to service its Harare–Johannesburg route. The plane currently flies to Johannesburg three times a week. The insiders said if Zambezi Airways agreed to the proposal, daily flights to South Africa from Harare and domestic routes would resume. update (13 April 2011): Air Zimbabwe chairman Jonathan Kadzura has been quoted saying that his airline has come up with a stop-gap measure to hire planes from defunct, privately, owned Zambian Airways. It is not clear how many planes are targeted but the move includes Zambian Airways crew who were left in the cold after the airline abruptly stopped operating. 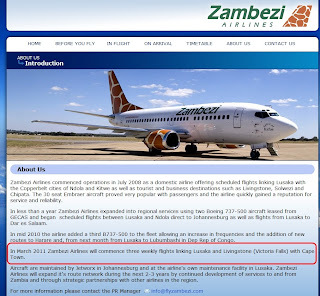 It is also not clear yet if Zambian Airways will be allowed to lease the planes owing to the ongoing court cases. Air Zimbabwe currently has only five operational aircraft – but the airline still employs 49 pilots and about 280 engineers to service one plane [link]. Air Zimbabwe currently has two operational Boeing 767s which service the Harare-London and Harare-Malaysia-China routes. Two Boeing 737s service regional and domestic routes and only one of three MA60s is currently active on the domestic routes. Air Zimbabwe pilots recently insisted they will not return to work until management pays them their outstanding salaries. update (12 April 2011): Air Zimbabwe acting chief executive officer Innocent Mavhunga on Monday said the airline required at least $4 million to pay striking pilots. The salaries for pilots of the airline had been between $3 000 and $7 000, but as the performance of the airline declined, management saw it fit to reduce the salaries to between $1 000 and $1 500.
update (11 April 2011): Zimbabwe's president Robert Mugabe and his wife Grace took an Air Zimbabwe plane to Singapore on Friday (08 April) and striking pilots had to be recalled to fly them. Air Zimbabwe board chairman Jonathan Kadzura justified the move yesterday saying the flight was not a commercial one but the pilots were on “national duty.” The Standard is quoting him saying: "There is a difference of going on strike for commercial flights and flying on national duty. You can’t say no to national duty because yesterday’s flight wasn’t a commercial one." Zimbabwean newspaper "Newsday" is reporting that there are still no signs of when the strike would end. Pilots and flight crews at the ailing Air Zimbabwe have decided to continue their strike over unpaid salaries, despite a Labour Court ruling on Wednesday that their industrial action is illegal. update (08 April 2011): Zimbabwe's Labor Court has ruled that the strike by Air Zimbabwe pilots and other staff is illegal and has ordering them to return to work within 48 hours. No comments from the Zimbabwe Flight Crew Association and Air Zimbabwe managementhave been reported so far. update (06 April 2011): Troubled Air Zimbabwe has again cancelled all its domestic, regional and international routes as "the pilots strike" has entered week three. In the meantime, the Air Zimbabwe management has reached out to the Ministry of Transport, Communications and Infrastructural Development to help pay up the nearly US$400 000 debt the airline owes in unpaid salaries and bonuses to its employees and to return all the attached assets. update (05 April 2011): Air Zimbabwe's woes were compounded yesterday when workers were legally granted control of airline property, including management vehicles. Efforts to stop the attachment and subsequent auctioning of the assets failed at the Zimbabwean High Court yesterday. update (04 March 2011): According to Voice of America, Robert Mugabe, who traveled on a special Air Zimbabwe flight to Zambia last week for a regional mini-summit, will order the carrier's management to pay part of the US$9 million in arrears on staff compensation. In the meantime, striking Air Zimbabwe pilots have threatened to attach the airline’s property over outstanding allowances and salaries amounting to US$9 million. btw - the management board of Air Zim is led by Jonathan Kadzura, a pig and poultry farmer, who hasn't got any background in the aviation industry. update (30 March 2011): Air Zimbabwe pilots are still on industrial action. All of Air Zimbabwe's planes are grounded and travellers who had booked flights with the national airline are being transferred to other airlines. update (28 March 2011): The strike by Air Zimbabwe pilots entered its sixth day on Sunday with no end in sight. As a result, the airline has leased a private aircraft to fly the Harare-Johannesburg-Harare route as a stop-gap measure to ease pressure caused by the strike. The service is operating on Tuesday, Thursday and Saturday with normal timings until further notice. update (24 March 2011): Regarding refunds of tickets for Air Zimbabwe flights - newzimbabwe.com is quoting Air Zimbabwe’s General Manager for Europe David Mwenga: "When tickets are bought directly from Air Zimbabwe, we pay back the customers by cheque, it’s a quick process. But when a ticket is bought from a travel agent, it’s a lengthier process and we pay back the travel agent not the traveller. It's an industry practice". The pilots of Zimbabwe's flag carrier Air Zimbabwe went on strike again on 22 March 2011 because of payment problems. The pilots are demanding the payment of their allowances over due since last year despite of the higher authorities promised to clear the outstanding balances regarding their services. It is estimated that the airline owes the workers unpaid salaries and allowances totaling around 9 million US Dollars. Talks to end the strike are under way, but no further information was made public. As a result of the strike Air Zimbabwe had to cancel most of the domestic, regional and international flights. update (04 April 2011): Weather forecasters said water levels in Namibia's north, near the border with Angola, were on the rise again. Guido van Langenhove, the head of Hydrology at the Department of Water, told Reuters: "We measured an increase of eight centimetres in the weekend, indicating another flood wave is on its way. However, water levels in the central and southern parts of the affected area are dropping rapidly. This means if it does not rain too heavily in the next two weeks, we will not experience new record flooding." Assistance to flood victims in the North of Namibia started on Friday, but the distributing teams are complaining about a shortage of transport. Four helicopters, three inflatable boats and one Police Land Cruiser with a boat trailer are not enough for the distribution of aid and transportation of people isolated by the floods. A permanent solution to flood-damaged water infrastructure along the Kuiseb River Delta (Walvis Bay etc.) remains on the radar of Namibia's national water company, NamWater. It is likely to cost millions of dollars in taxpayers money. This could also mean an increase in water price at the coast. The water supply to all towns at the coastal areas is closed every day from 22:00 to 05:00. The reason for the timing is because consumption is higher during the day and this would give reservoirs time to recover during the night. update (01 April 2011): The Namibia Meteorological Service is predicting more rainfall over the central and northern parts of the country next week, which could lead to a further increase in water levels. There are also reports from the Hydrological Services in the Ministry of Agriculture, Water and Forestry that a new flood wave in the Cuvelai Basin is heading towards northern Namibia from Angola. This flood wave is expected to reach Namibia around 01 April 2011, and coincide with the predicted heavy rains. Nearly 300 schools and 20 clinics are currently inaccessible due to floods in the northern Namibia. Estimated at least 10000 people are left destitute. update (31 March 2011): Travellers who are planning to visit Namibia's north, or who already made bookings for lodges in the northern part of the country, should double-check with the particular establishments if they are actually open for business. Hakusembe River Lodge - has reopened with two rooms and the floating chalet, but water levels may rise at short notice. Please call to check in advance. Impalila Island Lodge - the lodge is operating as normal. The airstrip is closed, and guests are being transferred by boat from Kasane. Lianshulu Lodge - the lodge is operating as normal. Update (01 April 2011): After due consideration and with reference to the market demand for beds in the Caprivi region of Namibia, it has been decided to suspend operations at Lianshulu Lodge indefinitely from 1 June 2011. Namushasha Country Lodge - the lodge is operating as normal. Follow the clearly marked detour signs. Ndhovu Safari Lodge - the lodge is operating as normal, but due to swamping of the access road, guests will be transported from the parking lot to the lodge by boat. The campsite is closed. Ntwala Island Lodge - the lodge is operating as normal. The airstrip is closed, and guests are being transferred by boat from Kasane. Susuwe Island Lodge - the lodge is operating as normal. High river levels have caused the temporary closure of Kunene River Lodge. The lodge does not expect to be able to accommodate guests or to take any new bookings before April 2011. In the wake of heavy rains across Namibia in the past week, forecasters say Namibians should brace themselves for more rain despite some parts drying up. Since 24 March 2011, several towns in Namibia have measured high rainfall figures. As a result, several neighbourhoods in eg Windhoek sustained serious infrastructural damage, and roads have become impassable in some areas. Rainfall figures in the northern, north-eastern and central parts of Namibia indicate that the rainfall has been spread evenly. NamWater has admitted that the current rains and resultant floods have caused "extensive damage to a number of NamWater supply infrastructure around the country", especially in the Cuvelai and Kavango areas. Several installations of NamWater have been washed away by floodwater and most of the water stations are under water causing electrical pumps to stop functioning. People in the Cuvelai and Kavango areas might therefore experience low pressure on the pumps or no water at all. update (30 March 2011): Namibia's President Hifikepunye Pohamba on 29 March 2011 declared a state of emergency in northern parts of the country after heavy flooding (the heaviest floods ever recorded) displaced nearly 10000 people and washed away roads. Some 62 people have drowned in Oshakati, 247 schools had had to close because of rising water levels, with clinics and homes submerged. The Namibian government has made available 30 million Namibian dollars to address the emergency. More rain in southern Angola was expected to increase chances of flooding in north central parts of Namibia, where rainfall is also expected. Water levels are on the rise along the Kavango River, on the northeast of Namibia, although the condition further up in the Caprivi region is somewhat stable. During the water closure periods the following public water supply points along 5th Road in town, in Frankie Abrahams Street in Kuisebmond and in Kruis Street in Narraville will be opened. update (28 March 2011): Due to increases in demand and the need to reduce water usage, NamWater, Namibia's national water company has announced that water at the coast (eg. Swakopmund, Walvis Bay) will be shut off between 22h00 at night and 05h00 in the morning. The Kuiseb River has reached the Walvis Bay Lagoon, and this has washed away the access road to Pelican Point, the Saltworks, Paaltjies and Sandwich Harbour. The road is being repaired. Flooding has forced the closure of schools in the Omusati, Ohangwena, Oshikoto and Oshana regions. update (26 March 2011): Flood levels in the Cuvelai basin in north-central Namibia are eight centimetres higher than in the 2009 flood season, setting a new record for the area where about one million people – half of Namibia’s population - live. So far 1,200 people have lost their homes and are accommodated in two temporary camps; Schools are closed for grades 1 to 10, because as the river gets higher, the small kids cannot cross any more. Apart from the highway, all the roads leading to Oshakati are washed away. update (25 March 2011): Ben Kuutumbeni Kathindi, the Mayor of Oshakati: "The 2011 floods situation can probably take us back 1 000 years because no one is able to measure up or compare the effect". Oshana and Ohangwena are the worst affected regions, while Oshakati is the worst affected town. Water levels in oshanas continue to rise, with spillovers to residential areas. Water levels in the Cuvelai system have risen by up to 10cm since Monday. The water levels are as follows: Engela 1.45 m, Shanalumono 1.48 m, Sky 1.30 m, Kandjegedhi 1.45 m, Shakambebe 0.78 m, Okalongo 0.66 m, Endola 1.64 m, Okatana 1.80 m, Oshakati 1.35 m, Ompundja 2.01 m, and Ombwana recorded 1.74 m.
The flooding situation is expected to worsen as more flood waves from Angola and heavy rains are expected in the northern regions. Also see the NASA Earth Observatory satellite pics of the flooding in Northern Namibia shot on 20 March 2011 and 17 March 2011.
update (23 March 2011): A combination of heavy rains and overflows from the Kavango and Zambezi Rivers are threatening tens of thousands of people in Northern Namibia to flee their homes. This season's unusually heavy rains and high flow of river water has caused the Zambezi River to reach record high volumes and has already caused damage to farmhouses, crops, livestock and infrastructure. Local government officials have already begun evacuating residents to settlement camps within flood-prone areas. According to the Head of Emergency Directorate, plans are underway to evacuate over 50,000 others over the next few weeks. Fresh heavy rains from the central parts of Namibia have once again brought back water shortages to the residents of Walvis Bay and Swakopmund, who will have to endure water rationing again, following damaged water infrastructure in the Kuiseb River. Fresh floods recorded in the Kuiseb River have extensively damaged the vulnerable infrastructure, leaving the Municipality of Walvis Bay no option but to resort to a total water shutdown, which started yesterday evening as from 21h00 until 06h00 this morning. Big kudos to Namibian tourism info source tourbrief (and other online resources) for keeping us updated regarding the current rain/flood situation in Namibia! Thx! Single tourist visa for Southern Africa?